Do you ever find yourself admiring an actor’s hair when watching a film or theater production? No matter what the character endures there is one constant: great hair! How are they able to keep that hair looking stylish when they’re constantly moving and sometimes performing stunts that would leave anyone else with a tangled mess of locks? The answer is thanks to their trained film and theater hair specialist. If you’re always starstruck at the amazing hair in film and theater, read more to find out if the glamour of film and theater is for you! What is a Film and Theater Hair Specialist? As a film and theater specialist you are behind the scenes of your favorite productions. You will bring mere ideas into a creative reality and allow the audience to become even more immersed in the world that the director has set up. With the help of a hair specialist, the actors are able to more accurately portray their character in both the time period and setting that the production is set in. A film and theater production is a huge project and hair specialists are a key component to making sure that you become totally involved in the story and characters. What Does a Film and Theater Specialist Do? 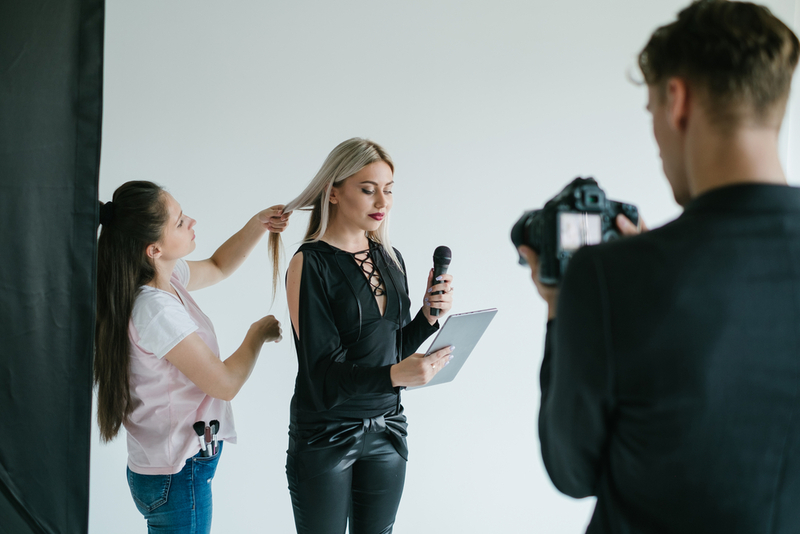 If a production is limited to a small team of people, then a hair specialist might be expected to apply makeup on the actors in addition to styling their hair. However, for most film and theater productions the director will want people who specialize in a certain area to make certain that the character looks as authentic as possible. Film and theater hair specialists have balanced the art of staying within the bounds of historical accuracy and adding in their own touch of creativity. It’s important that you make sure the audience believes the actors are set in the time period and setting the production is based on. This is also a career that allows your creative liberty to shine through to give the actors more personality. If the film or theater production is set in the future or a different world, then it’s time to let your creativity do things it’s never done before. This is your chance to work with other cast members and impress them with all the crazy hair designs you’ve always wanted to try out. What Skills Does a Film and Theater Hair Specialist Need? As a film and theater hair specialist you’ll be working directly with other cast members. This includes working with the camera crew, other creative teams and the actors themselves. Everyone has ideas and it’s important that you can listen to others and collaborate together to make the finished product the best it can be. Obviously you’ll work mostly with the actors. Just like a salon, you’ll often act as not only their hair stylist but as their confidant as well. Since you’ll be with them everyday for the duration of the project, it’s important to build a trusting relationship. The hair styles used in film and theater can often be so intricate that they take hours each day to design. Make sure that you do everything you can to help the actor feel as comfortable as possible to make the time go faster. The last thing you want is to dread going to work everyday because you and the actor don’t get along. Where Does a Film and Theater Specialist Work? Wherever you work, as a film and theater hair specialist you are an important part of making sure the actors are stage ready. When the cast relies on you that much, you can expect that they’ll be needing you at a moment’s notice. If you work with a company that travels you should be ready to go with them. When an actor’s hair falls out even a little, you’ll need to be there to ensure that the magic of the production is never lost. Who Can Become a Film and Theater Hair Specialist? Anyone with the passion for beauty can have this career! It can be daunting to try to get into the entertainment business but everyone has to start somewhere. While you probably won’t enter in this business working with the biggest names of Hollywood, you can start small with local productions to build up your credibility. Small productions will often hire people based on their portfolio to see what they’re capable of. That’s why having a cosmetology license is so important. It really can help you get the experience you need to have the career you’ve always dreamed of. If you’ve always loved watching films and theater productions for the beautiful and intricate hair designs and wanted to become a part of it, you should look into our cosmetology program! We offer this program at all six of our locations with night and day classes available to make sure that everyone has the opportunity to apply. You can learn a variety of hair techniques that can become your gateway to the entertainment industry. We teach our students everything from cutting and designing hair to coloring it. Contact us to find out more about how this program can be the start for your career dream to take off.